The image of a crack team of specialists rappelling down a cliff to whisk an endangered community away to a safe house, where they’ll live for two years until danger subsides in their native land, may seem like a plotline synopsis from Tom Clancy’s Jack Ryan spy thriller series on Netflix, or maybe even the summary of a U.S. Navy Seals after-action report. In both cases, however, you’d be wrong, for it describes a recent multi-day mission conducted by biologists from the Arizona Department of Transportation to protect native hedgehog cactus from a bridge replacement project on U.S. 60 where that highway crosses Pinto Creek six miles from the town of Miami, which is a little more than 81 miles due west of Phoenix. The two-year project, directed by ADOT and the Federal Highway Administration, involves constructing a new bridge adjacent to the existing bridge, and then removing the existing bridge. Built in 1949, the existing Pinto Creek bridge is “obsolete,” according to ADOT, and would be prohibitively costly to maintain even if converted into a pedestrian crossing. Yet the footings of the existing Pinto Creek bridge sit in one of the few areas in Arizona where the foot-high hedgehog cactus reside – so-called as this particular breed of cactus is usually covered in spines, often with red flowers on top, making it look like a hedgehog. The species is listed as endangered by the U.S. Fish and Wildlife Service and is protected under Arizona law. So, biologists and engineers from ADOT, the U.S. Fish and Wildlife Service, the Desert Botanical Garden in Phoenix and Tonto National Forest teamed up to protect it with a “rescue effort” aimed at removing the cactus plants from areas that will be affected by the bridge-removal effort. Over two months this summer, ADOT’s biologists collected entire cactus plants, along with samples, seeds and, stem cuttings – rappelling down sheer cliff faces in some cases to do so – then transported the whole lot to the Desert Botanical Garden where they will live for the next two years until the bridge work is completed and they can be repatriated. That two-month delay did not impact the cost of the bridge, either, he added. 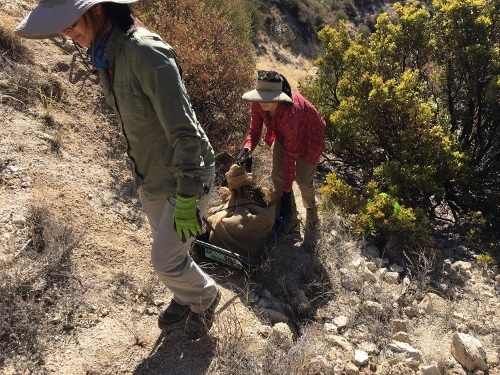 Protecting native plants and wildlife is part of every ADOT project, the agency noted, and it has deployed its biology team to do so in a number of ways. For example, along the South Mountain Freeway’s 22-mile corridor, saguaros, barrel cactuses and palo verde trees are being kept in temporary nurseries until they can be replanted along the freeway. Meanwhile, ADOT biologists working on the project have relocated animals including chuckwallas and burrowing owls. Another effort involving the New Ina Road bridges over the Santa Cruz River in Marana – built as part of an ADOT project creating a modern interchange at I-10 – include the installation of bat boxes that have become a new home for bats that lived in crevices under the old bridge.